Second Skin Thermal Block - Thermal Insulation Redefined! Thermal Block is the best thermal barrier we offer. This self adhesive mat is designed to face the heat source directly to reflect radiant heat and dissipate convectional heat up to 800 degrees f.
This composite heat shield has 3 layers of heat rejecting material for the ultimate in automotive thermal insulation. Thermal Block is the best thermal barrier we offer. 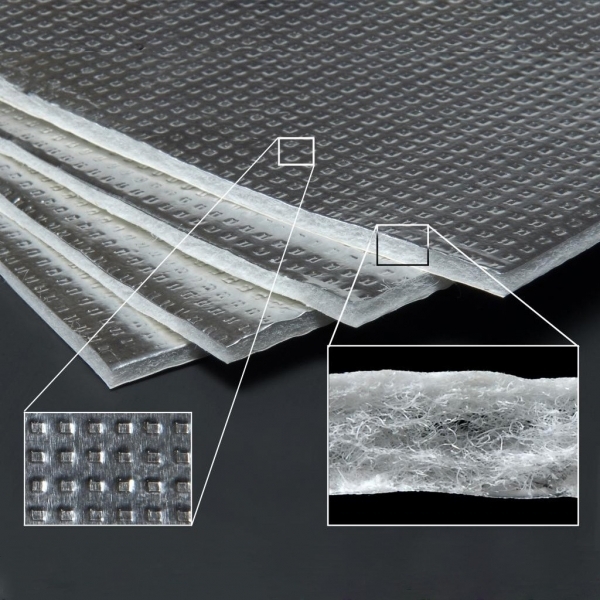 This self adhesive mat is designed to face the heat source directly to reflect radiant heat and dissipate convectional heat up to 800 degrees f. This composite heat shield has 3 layers of heat rejecting material for the ultimate in automotive thermal insulation. Easily, the best in class thermal barrier that we or anyone else can offer. Though this mat conveniently adheres to a surface with the easiest of cut-peel-apply actions, it can block off heat up to 800 degrees Fahrenheit / 426 degrees Celsius. With three layers of insulation, this sheet can offer great protection against heat, after being adhered to the engine side of the firewall or just above the exhaust in the exhaust tunnel, or even under the car for that matter. Though this product is designed to predominantly offer thermal protection, it can also drown out noise to a certain extent, thanks to the fibrous, organic core layer that captures and eliminates some of the sound waves that try to creep up into a cabin. To get the best of both thermal insulation as well as sound insulation, this product should ideally be used on top of a vibration dampening layer, like the Damplifier Pro vibration mat. When applied on top of a vibration dampening layer, it can do an excellent job of both accentuating the sound reducing effects of the Damplifier Pro and also doing a stellar job of keeping out great levels of engine, exhaust or even heat that is radiated by the road. To a degree this product can help increase the perceived output of your audio system because it helps reduce engine noise. The less engine noise you hear, the more music you hear. Thermal Block is the best thermal insulation mat we offer. 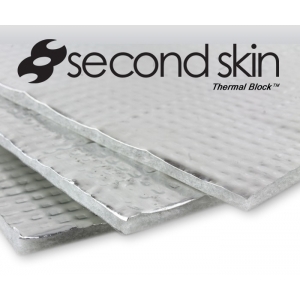 This self adhesive barrier is designed to face the heat source directly to reflect radiant heat and dissipate convectional heat up to 800 degrees f.
This composite mat has 3 layers of high quality thermal insulation for the ultimate in automotive thermal insulation. Apply on the engine side of the firewall, or under the car, above the exhaust for the ultimate in pre-cabin heat treatment. Yes! Thermal Block has it's own super-durable, high heat resistant adhesive. Just peel off the clear backing and stick it where you want it! How much heat will Thermal Block actually insulate my car from? Thermal Block will literally block any temperature up to 800 degrees Fahrenheit or 426 degrees Celsius. What are the most common and most effective uses for Thermal Block? Most people like to use Thermal Block on their firewall, but it also works great for blocking exhaust heat. Really anywhere you can apply Thermal Block facing a heat source is an effective place to apply it. Where SHOULDN'T I apply Thermal Block?